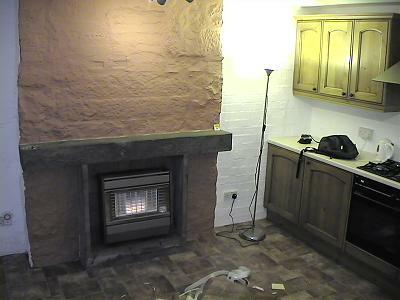 Cellardyke — we have carpets! 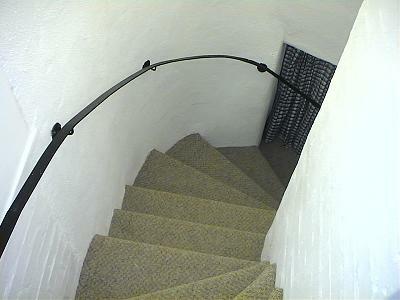 It was an exciting day for Jane and me today: our carpets were delivered and fitted in Cellardyke. 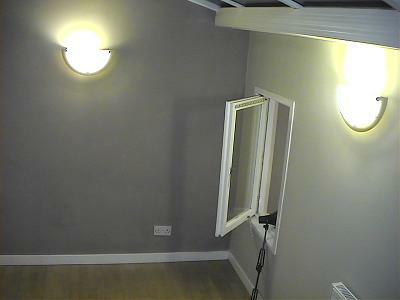 The two carpet fitters who arrived around 09:15 were fabulous, staying until 19:00 to complete the job. 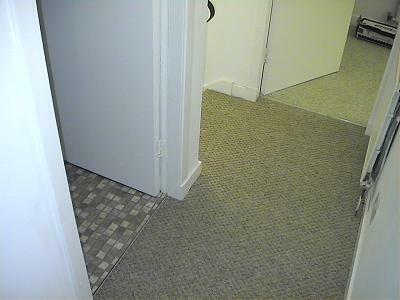 They fitted carpets in two bedrooms, the living room, hallway and stairs, and vinyl in the bathroom and kitchen. The stairs was a massive job, as each stair had to be carpetted individually … and that was only once each of the 12 stone steps had been drilled, plugged and gripper screwed to it. While the two carpet fitters were busy at work, Jane and I finished painting the conservatory, I fitted new wall lights and blew a fuse one some dodgy wiring on a fused switch that I’d pulled out to paint behind. It was an experience trying to repair the switch in the dark, by the light of two pocket torches; we managed it, however. I wasn’t terribly bright today, either. I was clearing up in the conservatory (with Prof Plum and the candlestick) and I opened a black bin bag to put some rubbish and got paint all over my hands. “Ohh!” I muttered and went to the bathroom to wash it off with white spirit. Returning to the conservatory (with Mrs White and the revolver) I thought, “Now what was I doing? Oh, yes, binning rubbish”, opened the black bin liner and got white paint all over my hands! Again. I did that three times. Transforming our kitchen from a cold, white room into a warm country kitchen. Each step had to be individually carpetted, after it had been drilled, plugged and had gripper screwed to it. The intersection of three new coverings: light in the main bedroom, dark in the hallway and stairs, and the new bathroom vinyl. 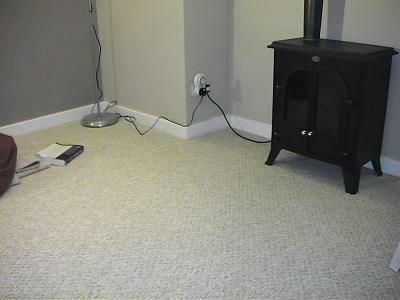 Newly carpetted living room, with ye olde style heater. 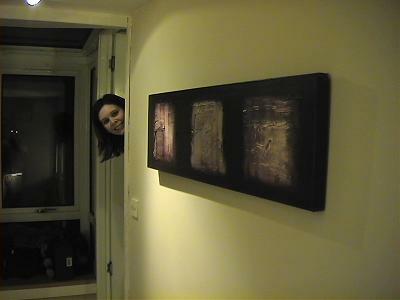 Jane’s new picture hangs proudly in the living room. We’re back again on Saturday to meet a man from Scottish Gas to price a new boiler (one that wasn’t last manufactured in 1983!). Then a mammoth trip to Ikea, methinks. Posted on Thursday 10 February 2005 Thursday 14 December 2017 Categories GeneralTags CellardykeLeave a comment on Cellardyke — we have carpets!